There really is no excuse for this game’s existence. Utilizing the weaving industry as a backdrop, Who Wants to be a Cotton Millionaire attempts to telegraph a few small facts to the audience using far too many clicks and far too little payoff. It’s difficult to see how this game came to be, but the idea is simple: pick historically straightforward options and attempt to reserve enough money to survive depressions. What’s wrong with his chin?! That, in and of itself, seems more than adequate a basis for a game, and there’s ample directions that could have been undertaken, however, that is not what happened here. It’s a “yes/no” branching tree with 4 pairs of options, and each option is simply a question of how well the player recalls their industrial history. Location, workers, power source, and primary investment. Each explanatory panel is a wind-swept landscape bereft of deep-dives into historic fact. Instead of offering something for schoolkids to learn from, the game is just a clicking simulator that allows students to pick obvious answers for so few potential outcomes that what ensues is an exercise in bad game design. This approach offers a good set of ideas based on demonstrated worst practices, and from this we can gain some ideas. A game that can be played in less time than a standard TV commercial is not really a game, is it: offering players depth and longevity of play is important, especially when the topic is educational. There is no good excuse for superficial history lessons: if creating a game in history, endeavor to bombard the player with facts. They will only consume as much as they need to proceed, and “too much” should be dictated merely by presentation and space concerns. Don’t go halfway on disciplinary approaches: if your game is rooted in economics, then apply economic principles in a meaningful way. Simply giving the player a “maybe this will happen” for an arbitrary outcome is not fun or click-driving. Make sure your game is not limiting itself in scope: the temporal frame for your game may differ from others, but it should still have a real-time translation that makes it easy to become immersed in the history. An introduction-to-history story is not a click-driver, but it could be if the details behind it are more exacting. For example, if you are making a game based on the history of a single battle, having precision in the options and the outcomes is important, and because it’s time consuming, it offers the player something more. …but don’t bury the player in options: players are indecisive, and the biggest turn-off to a game is the frustration level. Taken together, these two factors suggest that making a player constantly choose is a risk taken in the direction of simply losing your audience partway through. Ask yourself, “would I play this?”: if your digital project or future projects are games, ask yourself if the game is a platform for the history or if it’s simply a fact-regurgitation system. If you are doing an economic simulator, having an idea of value in numeric terms rather than arbitrary quantities is vital. Making important systemic roots core rather than an adjunct to the history lesson will keep players playing. Finally, ask yourself if you’d play any knock-offs: assume for a minute that your game idea is going to be so unique or interesting that it spawns a wave of imitations. Ask yourself if any of these would be a good draw for you. For example, if you had a game regarding the Stamp Act, would a game based on the linear recitation of the history engage you? Or, would you better respond to a game that allows you to play tax authorities trying to optimize the tax in order to keep the populace happy? AJ, thank you for this post- I really enjoyed how you specifically pointed out what practices you thought the game failed with, as well as what we can gain from them. -I agree with your first point- a game that is inherently short will only keep the players attention for a short period of time. 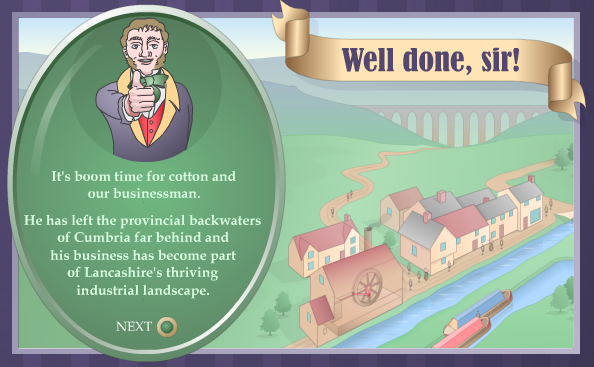 Additionally, if the topic of the game is educational, like Cotton Millionaire, the probability of the player learning an adequate amount of history is minimal. Therefore, if the games mission is to educate the player, they are ultimately failing. -I also agree with your point, “an introduction-to-history story is not a click-driver, but it could be if the details behind it are more exacting.” As most players will not be total history-nerds, they will need an introduction into the specific history presented during the game. However, it is imperative to make this introduction exciting and inviting to someone whose primary intention is not to learn history, rather, is to play a game. Lastly, the game should not simply be a fact-regurgitation system, as you stated. It should be stimulating, interactive, enjoyable, as well as educational and fact-bearing. Hi AJ, thanks for reviewing this game and discussing it for us! I tried to play it but don’t have the right flash player installed in my computer so couldn’t experience it for myself. I understand (and tend to agree with) most of your points but I was confused/concerned with the second one you stated – “There is no excuse for superficial history lessons.” I agree! It is your point that game designers should bombard a player with information that made me pause. A lot of the material we’ve read in practicum suggests that its actually better to not overwhelm visitors/users with information. Instead of only reading as much as they want and then continuing, visitors may become frustrated and bored and give up. I think there is definitely an in-between stage where game designers/historians can give players/visitors/users a healthy and enlightening amount of information that encourages them to continue learning – and therefore is not superficial – without overwhelming them with material. Thanks for this post! I totally agree with your points. To be frank, the title of this game alone is quite culturally insensitive and would draw me not to engage. I will never understand games like this, where difficult history is romanticized. Aside from the overall insensitivity, the game is entirely too short. I wonder who are the creators of this game? Are they historians, economists, or just game developers? Also, want to add a disclaimer that I am basing this point off of your post. Unfortunately, I could not get this game to upload on my computer.